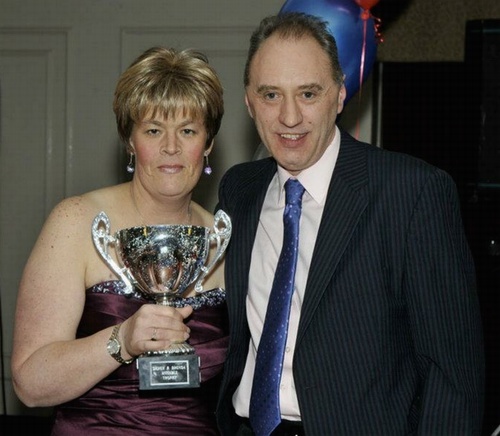 Santa Pod Racers Club Secretary Paula Marshall passed away on Sunday 6th January 2013 after a long illness. Paula was a tough character who famously took no nonsense and she took the same approach when she fell ill, putting up a fight as long as she could. Paula's husband, SPRC Chief Starter Ian Marshall, told us that at the end Paula was not suffering and passed away peacefully. As Club Secretary there was none better than Paula and likely never will be. Paula's knowledge was encyclopaedic - there wasn’t anything she didn't know about organising a race event, about the rules and requirements both for events and any class you could care to name. She was available for enquiries and advice at all hours. Her vast contribution to the sport was recognised in February last year when she was awarded the Alex Brachtvogel and John Ledster Memorial Trophies. Longtime fans will also recall that Paula raced the Highlander Camaro in Super Gas and Super Modified and had an event win to her name in Super Gas. Paula was a supporter of Eurodragster.com since its inception and over the years we developed a strong working relationship and friendship. Some features of Eurodragster.com which are nowadays taken for granted were instigated by Paula such as event entry lists and pre-event notices to racers, and she was always on the end of the phone for advice, practical help, and cheerful chat. UK and European drag racing have suffered an irreplaceable loss, and we have lost a dear friend, wife and mother, daughter and sister. Our deepest sympathies to Paula's husband Ian and daughter Holley, to Paula's parents John and Margaret, to her sister Gillian, and to all of Paula's family and friends. We have received the following tributes to Paula. To send your own tribute, E-Mail tributes@eurodragster.com. RIP Paula, thank you for your time and caring for us racers. Heartfelt condolences. Life can be so cruel. Paula you were taken far too soon. Our thoughts are with you too Ian and Holley. God bless you Paula. Ian, Holley and family our deepest condolences, We are finding this very hard to write and keep composed. Sorry Ian and Holley we should be as strong as Paula / Mum. God Speed Paula we love you and always will XXXXXXX. Our deepest condolences to Ian, Holley and family. RIP Paula, you will be missed. So sorry to hear about the loss of Paula. Our thoughts are with Ian and Holley. Rest in peace Paula. It's hard to find words to add to the many tributes. We owe Paula (and Ian) so much for all the work they have have put in on our behalf to help enable the many great events we have enjoyed over the years. Thank you Paula. My thoughts are with you Ian, Holley and family. Our deepest sympathy to Ian, Holley and family on the sad loss of a very special lady. Highly respected, deeply loved and forever missed. What a sad loss for drag racing. Paula will never be forgotten and will be looking over us all every time we race at Santa Pod. My heartfelt condolences to Ian, Holley and family. Sincere condolences to Ian, Holley, family and friends. Paula was always more than helpful to us as we compiled and worked to deadlines on the Santa Pod Raceway event programmes. She was a wonderful person in the drag racing family and will be very sorely missed. Paula, thanks for your good help that you always gave us, we will miss you... Ian we wish you and your family all the strength that you need to overcome this huge loss. Rest in peace Paula, only the good die young, this is very difficult to understand. Our deepest condolences go out to Ian and the rest of the family. Thanks for all your great efforts Paula. You will be missed! So sorry to hear the sad news, Paula was always so very helpful and caring, will be greatly missed by all who knew her. The amount of tributes sent says everything about Paula. She was very special to us all. Take care Ian, Holley and family. Santa Pod Raceway and the sport of drag racing have lost a very special lady! Paula will be deeply missed, our sincere condolences go to Ian, Holley and family. Rest in peace Paula. Our deepest sympathy to Ian, Holley and family on the sad loss of a wonderful lady. Paula will be sadly missed. We were always impressed when we phoned Paula with a query. Her knowledge of our own team made us feel special. Someone you never needed to say who you were to. Thank you so much Paula for everything you did for us all. We will never forget you. Our thoughts are with her loved ones at this time. We were all very saddened to hear of the passing of Paula our very sincere condolences, love and best wishes go out to Ian, Holley and the rest of the family at this very difficult time. You will be sorely missed and never forgotten, our thoughts are with all the family. So sorry to hear about the loss of Paula. Our deepest sympathy goes out to Ian and Holley at this sad time. Paula was one of a kind, a true star and will be sadly missed. Rest in peace. I know I speak for the entire SFI Tour group on how sad it was to hear of Paula’s death. She always made us feel at home and no request was too small. We always looked forward to having an exchange with her during the Tour stop at Santa Pod. We remember the first time we saw Holly she was in a carry basket. Having been through stage 4 cancer myself I know full well the effect it can have on a family. My God give Ian and Holley a special hand. Such sad news about Paula. To us, she was the SPRC headmistress whilst we were the naughty school boys who could never get an entry form in on time – she was always there for support and advice. A true leading light in modern British and European drag racing. We will miss her a lot and will never forget. Our deepest condolences to Ian, Holley and the family. Very saddened to hear of Paula's passing, she will be greatly missed. Santa Pod will be a quieter and lonelier place without her. Condolences to Ian, Holley and family, always in our thoughts. We were all so very saddened to hear this news and would like to send Ian and Holley our deepest sympathies. Paula helped us as a drag racing family from our very first outing and her guidance and friendship will be greatly missed. Never forgotten and always in our minds... RIP Paula Marshall. RIP Paula. You will be sorely missed, always friendly, always patient and always helpful, without you going above and beyond the call of duty most of us would never have raced. A true hero of the sport. Our deepest condolences go to Ian, Holley and family at this difficult time. Paula was a great asset to British and European drag racing and will be deeply missed. I was so sad to hear the passing of Paula; it brought a lump to my throat as I have known her for many years. She was a true legend in the fact that she knew everything you needed to know and find out, and she assisted everyone in the same manner. Paula also supported me when I was going through a similar health issue many years ago and always asked if she could do anything for me and always kept my spirit up to keep me racing. Myself, along with hundreds of the other drag racing family will sorely miss her – R.I.P. x My thoughts go out to Ian and daughter Holley. We were so sad to hear Paula lost her battle, she was a great character who earnt the respect of the racers with her no nonsense approach to running the SPRC as well as being a tough race car driver. Paula touched all our hearts and will be sadly missed. All our love to Ian, Holley and your families. Rest in Peace Paula. Our thoughts are with Ian and family at this sad time. Rest in peace Paula. We are very sorry to hear about Paula. Our thoughts go out to you and your family. Paula will be sadly missed, you cannot replace such a lady in your family and our racing family. As with everyone, we were saddened to read of the passing of Paula, she was a diamond and was always there to help us out - normally when we had forgot to enter an event, she'd always make sure we got entered and everything sorted out. A big loss for Santa Pod and UK drag racing, our complete and deepest sympathy to Ian, Holley and family. RIP. I was very sad to hear the news of Paula’s passing. I know she was very much at the heart of the Santa Pod family and you will all miss her deeply. Please accept my condolences, my thoughts are with you all at this difficult time. So sorry for your loss Ian, Holley and family. Santa Pod Raceway and the drag racing world have lost a special person. Condolences to Ian, Holley and the family, our thoughts are with you! RIP Paula. Ian, Holley and family, so very sorry to hear of your loss. Rest in peace Paula. Sad news,condolences to Ian and family. Our deepest condolences go to Ian and their family and friends... our thoughts are with you. RIP Paula, we will never forget you. Needless to say Paula was a true servant to British drag racing. A few people have mentioned the description she had on the race car. I was old enough to notice it but not quite old enough to really understand what it meant. Looking back it was a great phrase. There's a big hole in British drag racing. Thoughts to Ian and the family. RIP we'll all deeply miss you Paula but celebrate all you did for the sport. We were saddened to hear the news that Paula lost her battle against cancer. She will be truly missed by everyone who has ever met her at the Pod and has had the pleasure working with her. Rest in peace Paula... Godspeed. It's a real sad day for our racing family, we have lost a fantastic lady who played a massive part in helping us get down the drag strip. Paula has been there from the start of my racing career and has to take credit for my various trophies over the years, because without her help it would not have happened. I'm going to really miss seeing your smile at the track Paula, thank you for everything you have put into British drag racing, god bless. My thoughts are with Ian, Holley and family. Even if I did not have much contact with Paula in my business attending races at Santa Pod I have only heard the nicest things about her from racers and the working staff throughout the years. My deepest condolences go out to Ian and the rest of the family. I hope you can find some light in this dark moment knowing that we are behind you. Are we racers, are we fans, are we team members... yes we are but one word describes us all... family, and when a member or our drag racing family leaves us it hurts us and saddens us. Paula will be dearly missed by us all and although I have only known Paula for five years it will be with a heavy heart that Darryl and I start the new season's commentary at Easter. You will always be in our thoughts and my sincere condolences are to Ian and Holley at this time. Can’t believe the news of Paula’s passing, gutted does not come close. She was always friendly and helpful sometimes bending over backwards to help us out though she always told me what a nightmare I was! When we went to Hungary Paula joined us in our pits and (along with the rest of the Santa Pod crew) really supported us. Santa Pod has lost a genuine asset. Our thoughts are with Ian and Holley and the rest of the family at this sad time. Paula! Not here with your knowledge, your helpfulness and good advice anymore. It is so sad. A big loss for the whole drag racing community. And of course my thoughts go to number 1 drag racing bloke Ian and charming little Holley. We were all so very sorry to hear that Paula passed away at the weekend. She will be very much missed by everyone who was fortunate enough to have met her. Deepest sympathies to Ian and Holley. My condolences to Ian, Holley, and the whole family for your loss, my deepest sympathies are with you. May Paula rest in peace, she will be missed dearly. We are so sad to hear of the passing of Paula. Such a truly special and remarkable lady who has done so much for us racers and the sport of drag racing in Europe, which is so much richer because of her tireless involvement, helpfulness, organisational skills and support. We were very honoured to be able to present her and Ian with our Wild Bunch Derek and Brenda Annable Award for 2011, for couples who do so much for the sport, and this was the summary of her part of their great partnership: "She is hardworking and always displays professionalism and dedication. As much-loved SPRC secretary, Paula works long hours to help ensure race meetings run well, and always has the racers' interest at heart, with a friendly smile along the way, showing constant commitment to them and the sport in general". Deep condolences to Ian, Holley and family, and all her many friends. We will all miss her. Race in Peace, Paula. Sending our strongest condolences to Ian and family. We always got the best service from Paula when visiting the UK and Santa Pod. She will be missed by us. Paula was such a lovely, happy, kind and helpful person. She always provided John and I with a plethora of information at each race meeting, making our job so much easier. She has been taken far too soon and will be sorely missed but always remembered. Our deepest sympathy goes out to Ian, Holley and family. It is with great sadness that we heard of Paula's passing. Even for a girl from "the North" this was a battle that she could not win. Our thoughts are with you all and in particular with Ian, Holley and the family. Hopefully you will find the strength to get through this difficult time. Our deepest sympathy to Ian and family, and to Paula's colleagues at SPRC - Paula was always so patient and helpful, we miss her. So sorry to hear the sad news. RIP Paula. Our thoughts are with Ian and family. Sad to hear about Paula, deepest sympathy to Ian, Holley and family. Just a few words to say that our thoughts are with Ian, Holley and family at this tragic time. Whilst our dealings at Santa Pod rarely involved the track, the few times when we did deal with Paula she was a very professional, supportive and amazingly knowledgeable person. As others have said already, our money is on her organising at least a Sportsman meeting by now up there – we’re betting she runs it superbly... RIP Paula and thoughts to Ian and Holley again. Our deepest sympathies to Ian, Holley and your families. Paula you will be sadly missed by all RIP. RIP Paula. Condolences to Ian, Holley and the family, uur thoughts are with you at this sad time. You never truly appreciate how close you become to the people in this extended family of ours until something like this happens. There will definitely be a hole left in the sport, but the legacy of a dedicated, straight talking and altogether special woman will always live on I'm sure. My thoughts and prayers go out to Ian, Holley and everyone else affected. Such sad news, rest in peace Paula, thinking of you, Ian and Holley. Our deepest condolences to Ian and Holley and Paula's family and friends, When we first hired the Santa Pod Junior Dragster, Paula and Ian were there helping out and cheering us on, Paula gave us the biggest cheer when Ricky did really well. That friendship continued when Ian and Paula gave us the opportunity to display our Junior Dragster next to Ian and Paula’s Camaro, Jon Webster's Mustang and John and Lesley Wright's Top Fuel car, what an honour. I remember the words written on the back of the Highlander Camaro when Paula drove it "No Balls, No Problem" very fitting to how she drove the car and her determination, Godspeed Paula. First off our love and sincere condolences to Ian, Holley and the family. I had the honour of racing with Paula in Super Gas and still remember when she showed me round the new car and I asked where the ironing board pulled out from and got that icy stare that only Paula could give. And sitting at an old Russian air force base (Kunmadaras) on there wine tasting evening drinking rosé wine out of a two litre lemonade bottle and putting the world to rights. We lose another member of our drag racing family. RIP Paula. So sorry to hear this sad news. Our deepest condolences to Ian and Holley. Dear, sweet Paula will be missed. Paula is and always will be my friend, that will never change. She gave me so much advice and info over the years. It was an honor to have known you Paula. God speed my friend until we meet again. My heartfelt condolences to Ian, Holley and the family. A very dark day again for the drag racing community. Paula was always helpful, always cheerful, always ready to fix whatever problem we had with entries. A tough cookie who took no nonsense, she earned everybody's respect by being fair, working hard and being efficient, organised and knowledgeable. Our hearts go out to Ian and Holley, who have shown great courage during her battle. Wish we could do more than sharing your grief dear friends. Paula will live on in our hearts and memory as the great person she was. Hugs and much, much love to her family. RIP Paula we will miss you so much. All thoughts go to Ian and Holley. My deepest condolences go to Ian and the family and friends... my thoughts are with you. RIP Paula, you will be missed. The whole of drag racing has lost someone special, I knew Paula not only through her work at the SPRC or racing together in Super Gas but I was also lucky enough to have her as a friend. My thoughts at this time are with Ian and Holley, RIP Paula, you will never be forgotten. I met Paula way back in 1990 at an IHRA event at Santa Pod Raceway. Paula was working at the top of the fire up road and I was crewing for a buddy. Paula was very helpful with any questions I asked and also found time to chat. Later when I became the promoter at Shakespeare County Raceway Paula was always a very fair lady at the inter club meetings being very helpful plus gave me good advice when ever I asked. RIP Paula. My thoughts go out to Paula's family and friends. Our very sincerest condolences to Ian, Holley and the rest of the family at this saddest of times. We will always remember her for her can-do attitude to everything, her cheerful smile, wicked sense of humour and raucous laugh. Her organisational skills will never be equalled be it organising a race or an awards dinner. God bless Paula, sleep peacefully and we will always remember you every time we think about drag racing . I think the header on this page could not have said it better. Paula was there on the telephone whenever you needed help with whatever problem. You could leave a message with confidence that she would always ring you back, an asset sadly missing with lots of companies and people these days. Without the massive help of Ian and Paula Marshall the British Drag Racing Hall Of Fame would never have got off the ground and it's down to her organising skills and dedication we have what we have today in many areas of our sport. Our thoughts and prayers go out to Ian, Holley and all the family at this very sad time. Paula was a lovely person and will be greatly missed, we are deeply saddened by the news of her death. God bless you Paula. Our deepest sympathy for the loss of Paula. We wish Ian and family all the strength to assimilate her loss. We will never forget her. My deepest condolences go to Ian, Holley and the rest of Paula’s family. A fabulous lady whose knowledge and tellings off helped me immeasurably, words cannot express how much I am going to miss her. It is with our deepest sympathy that we have heard of the passing of a wonderful lady and a major member of the European Drag Race Family. In my over 43 years connected with drag racing, I have never known a lady that gave so much of herself to our sport and was always there to help whoever needed that extra help. I had the pleasure of asking Paula and Ian to work with our Hockenheim staff for our 26th NitrolympX in the 2011 season and I found that together with Ian, Paula was a giant plus to our team and I would have given my right hand to have had Paula work with my organisation once more in 2012 but her illness had already reached a point that would not allow her to come to Germany. I have in my years seen many good people come and go,but Paula will always stay in our memory for the wonderful person she was. My personal regards and sympathy also go out to Ian and Paula's family. The loss can never be replaced but gone is not forgotten. We are so sorry to hear the loss of a great lady Paula Marshall. She was so friendly to us and we were always happy to arrive at Santa Pod and have a small talk with Paula. We were kidding and laughing with her all the time we met each other. She will be sadly missed by all of us. Our thoughts and deepest condolences go out to Ian, Holley and the family. Rest in Peace. I did not really know Paula however the dealings I did have with her regarding race entries etc showed someone with a natural passion for helping others and the wonderful enthusiasm that makes our sport what it is for all of us racers. Our thoughts are with Ian and all of Paula's friends and family. Our thoughts are with Ian, Holley and family at this sad time. Paula will be sadly missed by us all. So sorry to hear about the loss of Paula. Our deepest sympathy goes out to Ian and Hollie at this sad time. Paula was one of a kind, a true star and will be sadly missed. Rest in peace. Such sad news. I have some very fond memories of Paula, a fantastic person for whom dealing with your meeting entries / club issues was never too much trouble, plus a formidable opponent in Super Gas, I’m sure she done for me on the way to a successful final appearance and pipping me to third in the National Championship in 1999. With Ian they were Mr and Mrs Santa Pod and have done so much for the promotion and progression of our sport, I always felt they were perfectly matched as they shared an equal passion for drag racing. Paula thanks for the memories. God bless you Paula. Thank you for all your very hard work , enthusiasm , help , support and all round love of all the racers and sport. I am not sure everyone realised just how much you have done for us all for so long. Best wishes Ian to you and Holley , be very proud. Lovely lady, sorely missed by all. Our thoughts and hearts go out to Ian, Holley and family. I am so sorry to hear this sad news , we were all hoping that Paula would win this race but life is so unfair sometimes. Memories of Paula bring a smile as there was quite often banter / verbal abuse when signing on but always with good humour and quite often keeping an eye on Holley playing outside the signing on office. Santa Pod and British drag eacing have lost a great asset. Our thoughts are with Ian, Holley and family. We are so sorry to hear the news of Paula's passing. Our thoughts are with Ian, Holley and family at this time. Although we were aware she was poorly it's still comes as such a shock. Paula you were an angel, I wish I had a pound for every time I heard the words "Give Paula a ring, she will sort it" and she always did! PS sorry for all the late entries. I am so sad to hear about Paula's passing. My deepest sympathies go out to Ian and all of the family, RIP Paula. A big loss to the sport, Paula will be missed by many. All my best to Ian and family. So sorry to hear of the sad passing of Paula. A truly lovely lady and will be sorely missed. Our thoughts go out to Ian, Holley and all the family. Sad, sad news, Paula was a very nice lady, nothing was too much trouble when it came to drag racing, she was a true ambassador for the sport. We are all thinking of Ian and Holley at this time. She will be greatly missed. Extremely sad times, our thoughts are with Ian, Holley and Family, will be greatly missed. All our sympathy and thoughts for Paula's family, a very sad loss, a true first lady of drag racing and will be missed. So very sad, words can't explain. Tough to the very end as always. Wish everyone family and friends the very best at a very sad time. RIP Paula. A great loss, always helpful to us racers. RIP Paula. Sorry to hear the news, deepest condolences to Ian and the family, our thoughts are with you all at this sad time. So sorry to hear of the loss of Paula our hearts go out to Ian Holley and family. We are deeply saddened by this news. Paula was always helpful and supportive and will be sadly missed by all who knew Paula, our thoughts are with Ian and the family. RIP Paula. RIP Paula, our thoughts are with Ian and family. I knew Paula but I really didn't get to meet her properly until she came to Hockenheim in 2011. Paula and Ian pit marshalled for the bike classes in Hockenheim that year and our paths crossed a couple of times in the starting area, I was totally amazed at her knowledge and how fast she sized up certain situations going on and told me the solution before I could even start to think about what was going on. European drag racing has lost one of its best today. Paula will be missed and not only in England! My condolences to Ian and family. So sorry to hear the sad news. Our thoughts goes to Ian and the family. RIP Paula. Our deepest sympathy goes out to Ian and Holley; Paula will be sadly missed and she was always so helpful to us when we needed to ring her. Saddened to learn the news. Our deepest sympathies. May you rest in peace Paula. From a Pod addict's point of view Paula has long been synonymous with the excellent organisation there. Both her and her husband's enthusiasm and commitment to drag racing is both long and honourable, as I know from their acquaintance. A great loss to the drag racing community and deepest sympathies go out to Ian, Holley and all of Paula's family and friends. We are so sad and heartbroken to hear of Paula being taken from us all. Our deepest sympathy to all the family. We will never forget her. Truly shocking news to hear of Paula passing. We've always been greeted with a smiling friendly face and warm words from Paula who sorted anything that needed sorting just like that, nothing too much trouble. Our heartfelt thoughts go to Ian and Paula's family. Vary saddened to read this news of a very professional, friendly and helpful lady. Paula always helped me out, often with some silly questions from myself when I was a greenhorn racer. There are no words in such sad times except a shinning light has gone out for all of us. Santa Pod Raceway will never be the same. Our thoughts at this very sad time are with Ian, Holley and all the Family. RIP Paula, you will sadly missed by everyone. I had the good fortune to call you a friend, and a colleague. Our thoughts are with Ian, Holley and the family at this time. So sorry to hear the sad news about Paula. She will be sadly missed and our thoughts are with Ian and all the family. I would like to offer Ian and his family my deepest condolences at the tragic passing of Paula. For me, and I’m sure so many other racers, Paula offered an understanding and a sympathetic ear when needed, she had her finger quite firmly on the pulse of the racer and understood when our frustration had taken us to the point of no return, the willingness to help and her unfailing sense of doing the right thing when it was required was second to none. She will be so very sadly missed. God bless. Sincere condolences to Ian and family. We are both so sorry to hear of Paula passing away. She was always available to chat and help anyone and everyone, the racing fraternity has lost a true leading figure. Our love and thoughts go out to Ian, Holley and their family. Our sincere condolences to Ian, their daughter Holley, her parents and family with the loss of Paula. We have known Paula for many years and will always remember her as a very warm and friendly woman that always had time for a 'foreigner' with racing problems. Our thoughts are with Ian, Holley and family. She will be missed. Our hearts go out to Ian and Holley. Paula RIP. Always in our minds. For Ian, Holley and all of Paula's family, you have our deepest sympanthys. Paula was a wonderful women who will be missed. Our hearts go out to you at this sad time. I only met Paula briefly a couple of times and both occasions she was full of smiles and extremely helpful , so sad to hear the news our thoughts are with Ian , Holley and Paula's family at this difficult time . So very sad to read the passing of Paula, a top lady always willing to help you in any way possible, our thoughts are with Ian and Holley at this very sad time. Our deepest sympathies and condolences to the Marshall family. Paula was always a great help to our family over our racing careers and it was such a shame to read this sad news of her passing. Our thoughts are with all of Paula's family and friends, she will be greatly missed. May you now find peace and rest in your new home and life. I got to know alot about you since I turned from a drag race fan to a drag race crew member thanks to my partner Gary Malin. I didn't get to know you but when I saw you or passed you, you always had a big smile on your face no matter what pressure you where under even from the racers! Be sadly missed and irreplaceable. My thoughts are with Ian and his family she was a fighter and so sad her illness took her... SPRC will not be the same RIP Paula. Very sad day for any one who ever entered a race meeting at the Pod. Paula had time for every one. RIP Paula. Condolences to Ian and Holley. Absolutely gutted. Very sad news, Paula was always there for Sportsman racers. Our thoughts are with Ian and family. Such a sad loss our thoughts go to Ian and family. Paula, the help advice and support you have given us over the years has been so much appreciated, and I doubt any of us thanked you enough, nothing never seemed to faze you, no query was ignored or seemed to be too much bother. One no nonsense lady, with a wicked sense of humour, and we are going to miss you terribly. A tough act to follow. Our thoughts are with Ian and Holley at this sad time. From when I very first started drag racing back in the 1990s Paula was there in Super Gas, a super tough competitor. Paula and Ian made a formidable team. Paula was selflessly devoted to helping everyone who contacted the SPRC, Paula lived, breathed and slept drag racing, it was in her blood. Paula was one of those outstanding people who once met you never forgot. Paula's practical, no nonsense approach was a credit to her, it was a privilege to know Paula and it was always a pleasure to talk to her. Paula and Ian were a team, I cannot begin to imagine what Ian is facing, our prayers are with Ian, daughter Holley and their families at this most difficult time. Paula will be remembered for her gusty character both as an official and also as an occasional racer competing in the Highlander Super Gas Camaro. Whenever a racer was in need of guidance Paula would always be there to point them in the right direction. Her knowledge for the sport, rules and requirements in order to run a successful race event was second to none which didn't stop at events at Santa Pod. Sometimes, when the chips were down Paula was always there to offer help and support wherever she could to the Shakespeare County Raceway and to the officials of Avon Park International Racing Association. Sadly, last Sunday evening that helpful hand was taken from us. From all the officials and marshals of Avon Park International Racing Association and Shakespeare County Raceway, our deepest sympathies go out to Ian and daughter Holley, to Paula's parents John and Margaret, to her sister Gillian, and to all of Paula's family and friends. A fine lady whose passing will be sadly missed forever. So sorry to hear of Ian, Holley and all the families' loss of Paula. Drag racing has lost a wonderful lady, always ready to help. RIP Paula. So very sorry to hear about the passing of Paula. Our condolences and prayers go out to Ian and his family. Having been going to the Pod for over 35 years now, I feel as if the place will never be the same again. Rest In Peace Paula. Very sad news, our thoughts go out to Ian, Holley and family, rest in peace Paula. Very saddened to hear of Paula's passing, sincere condolences to Ian and Holley. Heartfelt thanks to Paula for all her hard work and the help she gave us over the years, for us she was SPRC. She will never be forgotten. Ian, anything you need mate, just ask. I didn't know Paula well, but my heart goes out to Ian and the family. Sad news ! Our thoughts are with Paula and family. So very sorry to hear of the loss of Paula, we have lost a real gem, our thoughts are with Ian, Holley and family. A huge loss, a very special person. I didn't know Paula too well outside of racing but it was always abundantly clear that she and Ian provided one of the biggest "rocks" of stability and common sense around our beloved sport for many years. Epitaphs tend to be a bit gushy but in Paula's case, she merits every plaudit she will inevitably get. If there is "another place", Paula will already be organising it better than it has ever been done before. Her illness was long and doubtless difficult, who better than Ian to be by her side? So sad. Such a sad loss of one of the nicest and great women of our sport, like most have said Paula's smile and happy face will be greatly missed my thoughts are with lan and the family. RIP Paula. Thoughts are with all the Marshalls right now. Paula was a giver who would do anything for anyone and certainly helped me huge amounts, the world is a better place for Paula having been here, she will be sadly missed. Our deepest condolences go out to Ian, Holley and all of Paula's family. Paula will be sadly missed in the drag racing fraternity. Always happy to help and offer advice no matter what, always full of smiles and understanding - a leading light of the SPRC has left us. Rest in peace Paula. Drag racing has lost another legend. RIP Paula, you will be sadly missed. Our thoughts with Ian, Holley and the rest of the family at this time. Very sad news,my heart goes out to Ian and all the family. Our deepest sympathies and thoughts go out to Ian and Holley on hearing the sad news about Paula. She was a lovely lady, always so very helpful, she will be greatly missed by all. So very sorry to hear of Paula's passing, such a lovely lady. My sincere condolences go to Ian and Holley. RIP Paula. Paula's passing is sad loss to racing and she will be sorely missed. Our thoughts are with Ian and the family. RIP Paula, you will be sorely missed. Our thoughts go out to Ian, Holley and family at this sad time. I am so sorry to hear that Paula has lost her fight with this awful illness. Although my time in organising drag racing was before Paula became involved I know what a time consuming, skilled and sensitive job it is. My contacts with Paula have been in more recent years and her efficiency and welcoming smile will be something I remember. Her name will be part of drag racing’s history. My thoughts are with her family. Although there are no words to ease the pain our thoughts and condolences are with Ian and family at this very sad time. In the relatively short time I knew Paula she was professional and sincere – it truly is a sad loss. She will be missed by all. RIP Paula. You made a massive impact on all of our lives and made UK drag eacing a better place. Help, advice or a friendly reminder – from my early days in Junior Dragster to moving up through Super Pro and into NFAA you could always rely on Paula and we all appreciate it immensely. We will never forget you. Our thoughts are with Ian, Holley and the rest of the family. We shall miss you. Sympathy and hugs to Ian and the rest of the family. What a terribly sad day upon hearing the news of Paula’s passing. A very sad day for the family and a very sad day for all who knew and were touched by Paula’s tireless efforts and contribution to anyone who needed her help, assistance or advice. A great competitor and great lady who was always available to help. To Ian, Holley and all family and friends, Cindy and I would like to send our heartfelt sorrow at you sad loss. We are very far away but our thoughts and prayers will be for you at this time. Very sorry to hear this sad news. Our thoughts go to Ian and his family. RIP Paula Marshall. US-Racing was hit by the very sad news and we will miss you Paula. Be strong Ian, hope to see you in the summer! We are very saddened to hear of the loss of a fantastic lady and friend in the racing world, Paula fought had against her illness and she did on the track. She will be dearly missed by all of the British drag racing world. Our deepest heart felt feelings go out to Ian, Holley and the rest of Paula’s family. Thank you Paula for all the good times you have given me at Santa Pod and other places around the world. Your smile has given me and other people good memories. So sad to lose somebody before their time. Paula was always there, always helpful, deepest condolences to Ian and family. Rest in peace Paula. So sorry to hear the news, my condolences to Ian and all the family. I didn't know Paula well but she was always a pleasure to meet. Donna and I had only just started racing when we discovered we had a health battle of our own to deal with. Paula was so helpful and understanding when I had to cancel meetings at short notice and how it all worked as we had very little racing experience. Donna was usually the organiser, so up stepped Paula to help me. People like Paula are the reasons we drag race. Our thoughts go out to Ian, Holley, her family and friends at this very sad time. Very sad to hear this, our sincerest condolences to Ian and family. Drag racing has lost one of its stars - rest in peace Paula. A great loss for drag racing. Gone but not forgotten. Hope Ian, Holley and family gain strength from the thoughts of so many . God bless you. Sorry to hear of the loss of a wonderful helpful person. My heart goes out to Ian and your family and friends. As has been said by so many we've all suffered a big loss. But I'm sure big John will look after you. So sad to hear of this sad loss of a great person, always at the end of the phone to help, your knowledge to the sport was tops, nothing was ever too much trouble. Thinking of Ian, Holley and your family at this sad time. RIP Paula. My deepest condolences to Ian and family, so sorry for your loss. Paula was always there when we needed her, thanks. RIP Paula. Very sad to hear about Paula. My thoughts go out to Ian and family and their friends. Rest in peace Paula. On behalf of the Outlaw Flat Four condolences to Ian and Paula's family. RIP Paula. Happy Super Gas days. RIP Paula. Sorry for your loss. My thoughts are with Ian and the family at this time. Such a sad loss of someone who did so much for Santa Pod and for drag racing, RIP. I was shocked and dismayed to read the very sad news. Over the years Paula was the very centre of the Club and the sport and unfailingly helpful. Mere words cannot do her justice. My deepest sympathies go to Ian, Holley and her family. RIP Paula. It's hard to put into words the amount of times Paula helped us when Zak first started in the Juniors,fFrom licenses to all the silly bits and pieces, she was always on the end of the phone with sound, knowledgeable info. Thank you Paula, you will be massively missed by everyone involved in the family community we call drag racing. God bless Ian, Holley and family. To Ian and Holley, we are so sorry to hear this sad news. Paula will be deeply missed by everybody involved in our sport. I had such a laugh with her whenever I called SPRC - chewing the fat and putting the world to rights... can't believe I won't be doing that again. She had a great no-nonsense attitude, didn't suffer fools gladly and told it as it was. Brilliant ! An enormous loss to us all. Our love and thoughts go out to you and the family. In memory of Paula Marshall. Our deapest condolences and heartfelt sympathy to Ian and family at this very sad time. Paula was always approachable, and I always had a good banter with her at the track (but I could never win). She will be a sadly missed character and friend to myself my family, and many many more racers who fequent the track. Paula will always be part of the Pod. And will be a very sadly missed fun filled lady. Deepest regrets on Paula's passing. Regards to you all. My deepest condolences go to Ian, Holley and her family. Like many others I worked happily with Paula for many years and always found her to be totally reliable and hugely enthusiastic about anything to do with the running of the SPRC. I am immensely saddened about her passing and there is little else I can say at this time. God Bless you Paula. In our short time within the drag racing community Paula always made us feel welcome, providing help and advice no matter what, always full of smiles and understanding, she will be greatly missed. Our thoughts and hugs go to her family at this time, we feel honoured to have met and known such an amazing person. RIP Paula. Always helpful and a warm smile. We will miss you Dear Paula! From Telephonebox Racing Team, RIP. Our thoughts are with Paula and her family. I'm so sorry to read of Paula's passing, to Ian, Holley and all of Paula's family I send my sincere condolences, this is very sad news for the whole of national and European drag racing. I'll always remember the slogan she had on her Camaro "No Balls - No Problem" and it certainly wasn't, she gave as good as she got on the track and was one tough cookie! We'll all miss you Paula, you may be gone but you'll never be forgotten. With all our love and memories. So sorry to hear the loss of such a lovely lady, thoughts go out to Ian, Holley and family. I am so sad for Ian and the family that they have lost Paula, she was for me a lovely lady who was fun to talk to, and the leading light of the SPRC. A very sad day indeed. My thoughts are with Ian and Holley, God Bless. The sport has suffered a terrible loss, truly sad news. I never met Paula but spoke on the phone many times when booking events. Paula was so friendly and even answered in the middle of her weekly shop, nothing was ever a problem or too much trouble. Deeply saddened to hear this news and our thoughts are with Ian and family at this time. Gutted. Paula was good to me over the years always said hi and helped when I needed to know anything. I will miss you as will all who had the pleasure to know you. My thoughts are with Ian and family. RIP Paula, We are really going to miss you. Thoughts are with Ian, Holley and family.